Today my mom is having outpatient surgery. I knew that since I'm the one taking her, I'd have plenty of wait time. And, here I am waiting. Not sure if I'd have internet access or battery; I came prepared. 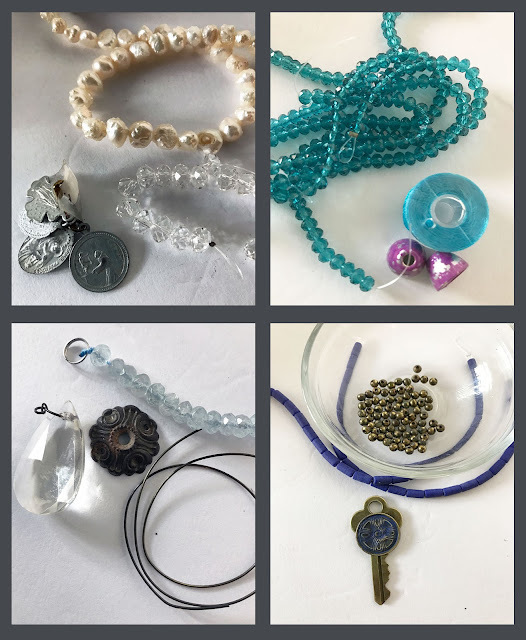 I've not only got my laptop and phone (plus chargers), my journal and a notebook, a book to read, some coloring pages and gel pens, and snacks; but I've also got a few jewelry-making supplies. As usual, I'm over-prepared. I like it that way. 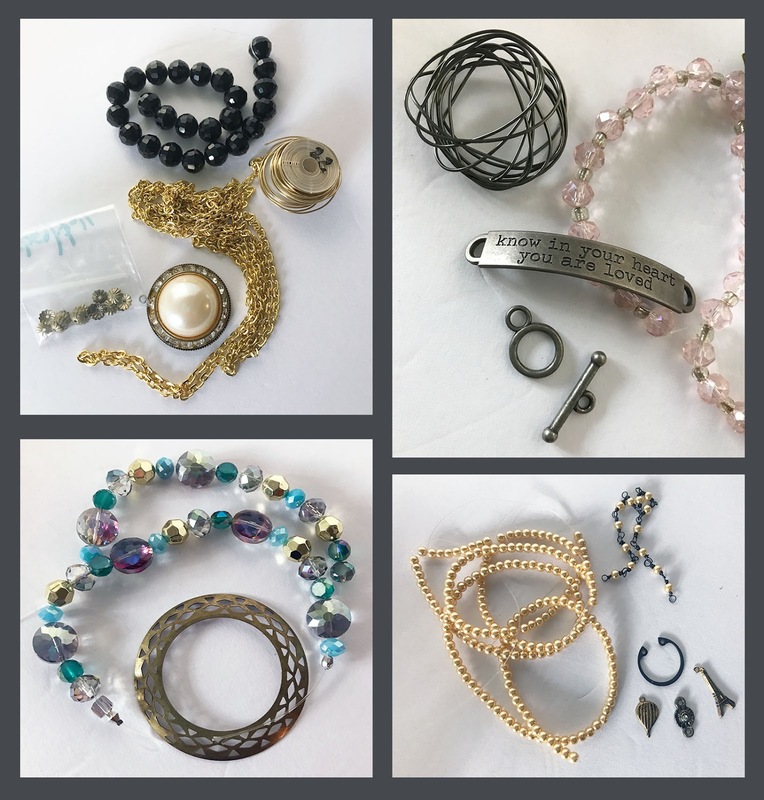 Since I spent several hours yesterday gathering the jewelry supplies, I figured I'd share some of what I collected. I started with this craft organizer that already had a selection of beads and focals packed for vacation. 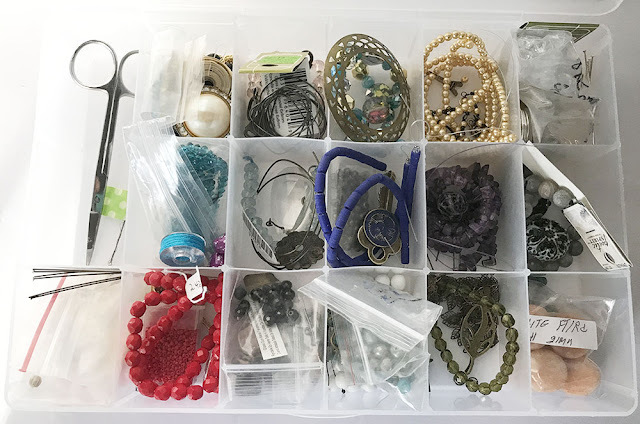 With this in hand, I decided to tackle it like a muffin tin jewelry challenge and fill each compartment with the supplies needed to complete a piece. 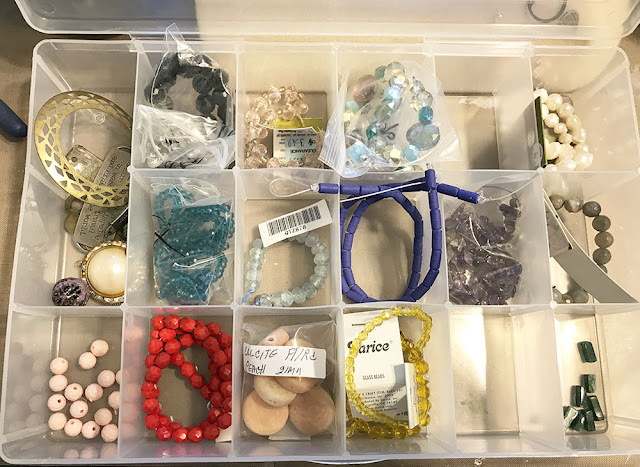 For the most part, I used what was already in the container, removing only the yellow beads as they just didn't speak to me. As well, I tried to use the focals that were already gathered. There weren't near enough focal elements for this task, so I dipped into my inspiration jar to select the rest. In the end, here's how the box looks now. I tried to put the wire I would use in the large compartment on the left, but there just wasn't enough room. Instead, there's a small pair of scissors and a few beading needles there. Let me give you a closer look at what I assembled. #1 holds a focal made with an old pearl and rhinestone earring. As well, there are black Chinese crystals from ZnetShows.com, gold-tone chain and wire, and brass bead caps. #2 is a Tim Holtz bar that I bent for bracelets, pink crystals, a toggle clasp, and Vintaj Arte Metal wire. #4 is a project I had just started and decided to throw in one of the open spaces. It's a hardware semi-circle thing, a few charms, and glass pearls. #5 is a strand of freshwater pearls, a strand of clear crystals, and several religious charms. #6 contains teal Chinese crystals, beading thread, and a couple of bead caps I altered with Vintaj Patinas. #7 is my favorite of the whole box. There's an old chandelier crystal, a strand of aqua dyed quartz, an elaborate brass hardware piece, and aged brass wire. #8 has a key that's been decorated with a smashed and colored button. To go with it, I added cultured sea glass tubes and small brass colored beads. #9 holds a strand of amethyst chips, an enameled filigree bead, and a couple of charms. #10 is another favorite with a strand of labradorite, a lampwork bead, an enameled filigree bead, and a ceramic bead from Gaea. 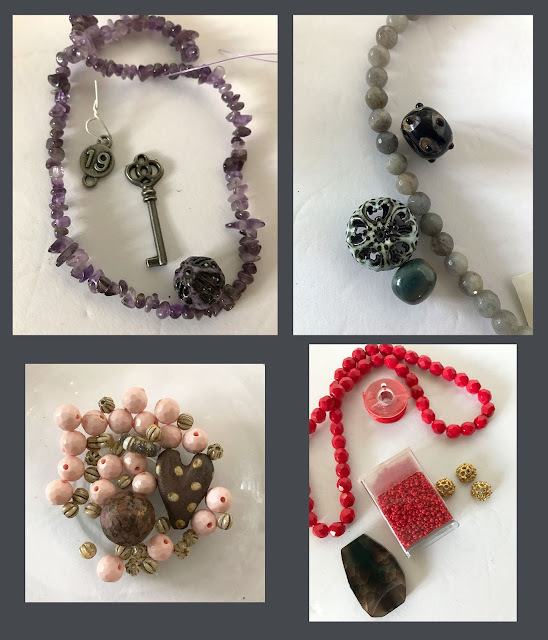 #11 has another bead from Gaea (the heart bead), a polymer clay bead from Shipwreck Dandy, a lampwork bead from StudioJuls, pink plastic beads from an old necklace, and some Picasso Czech glass beads. #12 was a tough one. I wasn't sure what to do with those bright red beads. But, the large brown stone seemed to compliment it just right. I added a few gold colored bead caps, red beading thread, and red seed beads. 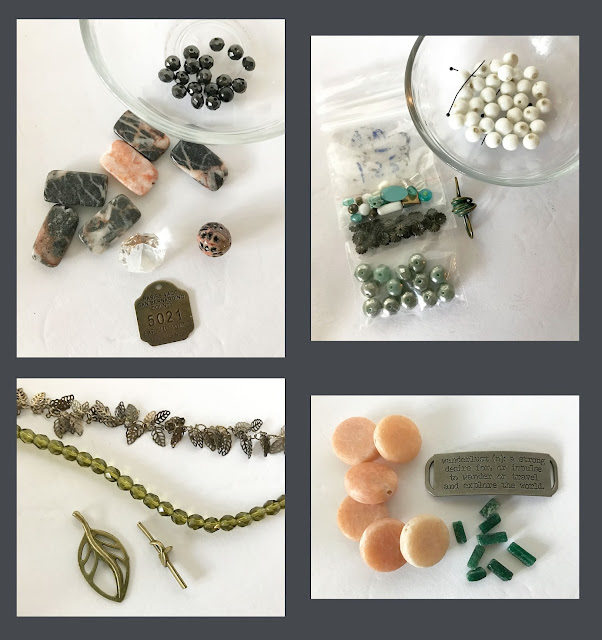 #13 contains a reproduction dog tag, an enameled bead, a chandelier crystal, black glass beads, and stone beads. #14 has a ton in it. There's vintage white glass beads, Czech glass beads, and industrial chic element, brass bead caps, and a selection of small, various coordinating pieces. #15 initially started as something else, but when the ceramic bracelet bar fell out of my hands and broke, I went in another direction. I kept the leaf fringe chain and leaf toggle but added a strand of olive green glass beads. #16 is a conglomeration of what was left in the box: a large Tim Holtz tag (bent for a bracelet bar) and two different types of stones. We'll see how that one comes together. 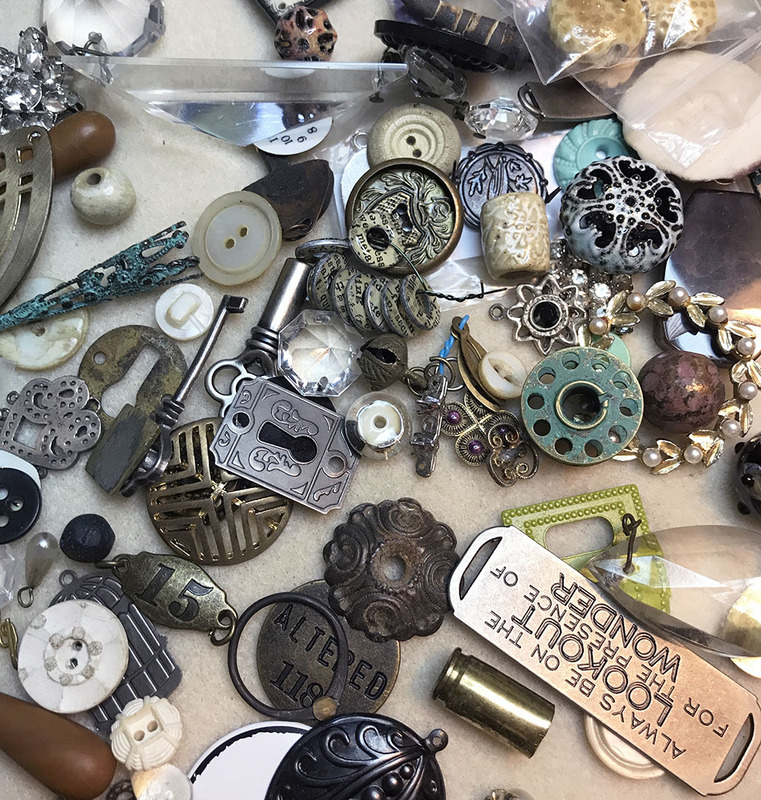 In addition to all these elements, I've got a baggie of wire spools, a few neutral filler beads, pliers, and a bead mat on a clipboard. Most of the compartments also have any findings I might need (jump rings, headpins, etc.) Like I said, I think I'm prepared. Of course, I don't believe I'll NEED all of these items today for the short procedure. But, I've got this prepped and ready for today and the days to come. It's nice knowing the decisions are made and all I have to do is create. Now, to just off the internet and get to it. wow that is a lot of inspiration - and organization!! my beads always seem to be a disorganized mess ... but through the chaos I find my inspiration - ha!